Pastor Alissa has served as the Associate Pastor of Lake Park Lutheran Church since 2018. Pastor Alissa was raised in Ohio and spent her childhood running free at the Lutheran summer camp that her father directed. She attended Valparaiso University where she majored in Social Work and minored in Theology as well as Peace and Social Justice Studies. To her own surprise, in the years after graduating from college Alissastarted to seriously discern a call to pastoral ministry. Alissa is a graduate of Yale Divinity School where she earned her Masters of Divinity as well as Luther Seminary where she completed a Masters of Arts. Alissa thinks of being a pastor as an organizer, journey-companion, preacher, and bridge-builder. 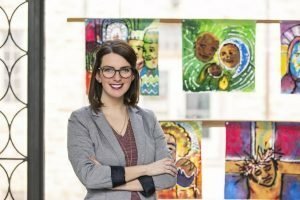 She has worked at churches in Ohio, New York and Minnesota which have cultivated Alissa‘s enthusiasm for creative, innovative, multi-cultural approaches to ministry. In her role at Lake Park Lutheran Church, she brings those passions to how she works with children and youth. Alissa‘s life is made rich by her relationships with her family, her wonderful friends, and her spouse Kevin. She enjoys traveling, cooking, and indoor rock-climbing. Alissais always eager to talk about new places to travel, coffee shop recommendations, and figuring out what it means to walk through this life as a Christian today.